Applications are OPEN NOW for 100% Fee Relief Scholarships. 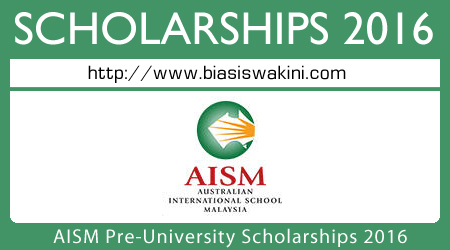 We invite Malaysian students who may not otherwise be able to attend the Australian International School Malaysia (AISM) to apply for a 100% Fee Relief Scholarships 2016 . With Australian qualifications recognised by higher education institutions globally, the Australian pre-university certificate can open up a world of possibilities. The Australian International School in Kuala Lumpur is offering our Pre-University or Matriculation Scholarship, the New South Wales Higher School Certificate (HSC), for Malaysian students for Years 11 and 12 (equivalent to British A Levels), which is the last two years of schooling prior to university entrance. The Higher School Certificate is an internationally recognised qualification equivalent to A levels, IB Diploma and other pre-university courses. The scholarship encourages students to aim for their personal best, achieve academic rigour and actively involve themselves within the school community. What is covered in the scholarship? - Covers 100% of cost of discount of Admissions Fee and Tuition Fees for the entire duration of schooling at AISM from year of entry. Books and basic stationery are provided by the School. - Does not cover the cost of uniforms and camp/excursion fees. - The scholarship will be extended to cover the fees for some university degrees at Taylor’s University, depending on your child’s performance, (terms and conditions apply). The award of the scholarship is based on the strength of the student’s academic performance, a strong background in other school activities including leadership, sport and the arts, and school community involvement. Preference is given to those who would not otherwise have the opportunity to attend and benefit from a school such as AISM. Please fill in the Application Form from here and send it to the Principal at the address stated on the Form. Shortlisted candidates will be required to attend an interview and assessment. For enquiries, please contact PA to Principal at 03-8949 5000 or email paprincipal@aism.edu.my. 0 Komentar untuk "AISM University Scholarships 2016"